Click here for the Compact Financial Keyboard. 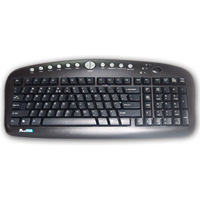 Click here for the Evoluent Mouse Friendly Compact Keyboard. Click here for the Compact Financial Scissor-Switch Membrane Keyboard. Click here for the Slightly Compact Multimedia 'A' Style Slanted Keycap Keyboard.